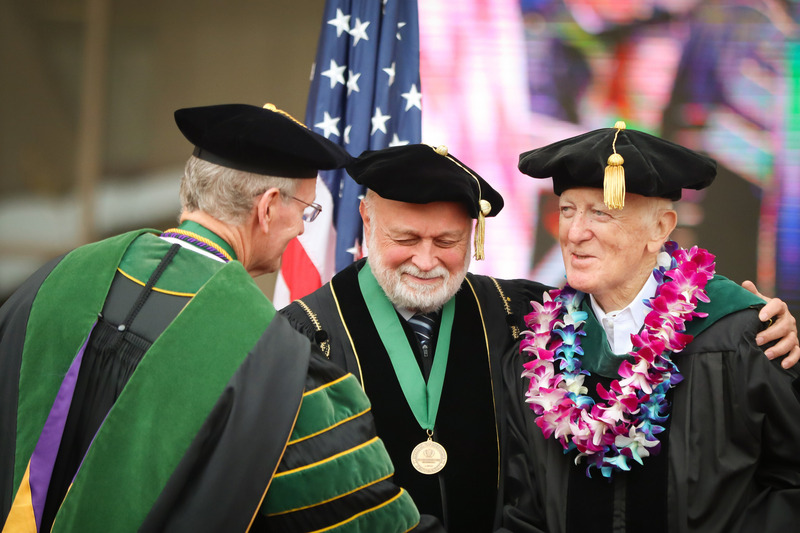 LOMA LINDA, CA — May 29, 2018 — Loma Linda University (LLU) School of Medicine presented a Lifetime Service Award to alumnus Leonard Bailey, MD, during the commencement ceremony on Sunday, May 27. Bailey, an iconic surgeon, was recognized for his four decades of leadership and research in infant heart transplantation. Bailey’s groundbreaking work began early in his career when he confronted the disturbing reality that existing reconstructive surgical procedures were inadequate for babies born with certain complex congenital heart diseases. In 1984, Bailey made medical history when he transplanted a baboon heart into the infant known as “Baby Fae.” Although she died twenty-one days later, this pioneering endeavor paved the way by November 1985 for the first successful human-to-human heart transplantation in 4-day-old “Baby Moses.” Bailey went on to transplant hearts in 376 infants and actively participate in the evolution of the field of heart transplantation — making possible long-term survival for infants and children with heart problems. “Since Leonard Bailey’s breakthrough procedure, thousands of children’s lives worldwide have been saved because of infant heart transplantation,” said Ronald Carter, University provost, during the award presentation. “Central to the extraordinary events that captured the attention of the world and made medical history was Leonard Bailey. Bailey’s lifesaving contributions in the field have transformed Loma Linda University Children’s Hospital into the world’s leading pediatric heart transplant center. Daniel Udrea, senior class president, also paid tribute to Bailey during his remarks. In addition to Bailey, the University honored the academic excellence of a new generation of 189 physicians and medical researchers who have completed this phase of their academic journey.